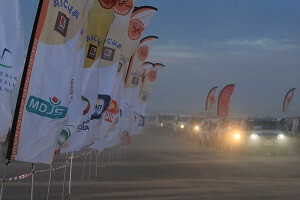 The first marathon leg of the competition, L3 – Rallye Aïcha des Gazelles 2016 will span two days, leaving the bivouac EL BEÏDA and finishing in IZOUGGUERHN. Part of the ongoing coverage of the 26th edition of the Rallye Aïcha des Gazelles du Maroc – the all-woman, off-road rally raid that brings women between the ages of 18 and 65 from more than 30 different countries together in the Moroccan desert. Route X: The ‘Expert’ course, mandated for those in the expert class and an option for others who dare, faces walls of sand and check points at high peaks that will prove to be daunting to obtain. They will have to circle the bases and find ways to climb the dunes to advance. Route Y: Passes very close to the highest peaks, but proves easier to navigate. The terrain is more rugged, and will get more challenging through the day. Route Z: The least intimidating of the 3 routes, sticking to the feet of the dunes. Perhaps the best option for less experienced Gazelles, as it has less steep dunes and shallower hallows, it still presents the challenge of lots of sand to face. All routes will have to clear with enough time to cross the soft sands as they exit the dunes to the last checkpoint of day 1, setting up camp in the open bed of sand for DAY 2. On Sunday, they will face Oued Rhéris, an almost 6 kilometres wide ephemeral river bed that can remain dry for decades at a time or suddenly flood following heavy rains – with huge cracks and crevasses to navigate, and wet zones that will stop any vehicle in its tracks. After the oued, a wide plain with very few landmarks and 30-kilometer long headings leads to an area that some call Gazelles Hell. The map of this area is strangely sparse and the features are not easy to identify for navigators, it will be hard to find their CP in order to continue their route.